Curecanti National Recreation Area, in Colorado, is formed by three reservoirs, named for corresponding dams on the Gunnison River. The national recreation area borders Black Canyon of the Gunnison National Park on the west. Panoramic mesas, fjord-like reservoirs, and deep, steep and narrow canyons abound. Recently discovered dinosaur fossils, a 6,700-acre (20 km2) archeological district, a narrow gauge train, and traces of 6000-year-old dwellings further enhance the offerings of Curecanti. Blue Mesa Reservoir is Colorado's largest body of water. 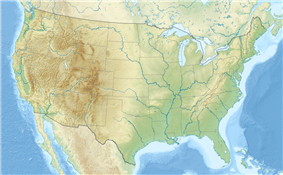 Created by Blue Mesa Dam, Blue Mesa Reservoir is 20 miles (32 km) long, has 96 miles (154 km) of shoreline, and is the largest Lake Trout and Kokanee salmon fishery in the United States. Blue Mesa Dam was completed in 1966, becoming the first large dam built along the Gunnison River. The Black Canyon of the Gunnison begins below Blue Mesa Dam. 12 miles below Blue Mesa Dam is Morrow Point Dam. Morrow Point Dam was completed in 1967 creating narrow Morrow Point Reservoir. While the primary purpose of Blue Mesa Dam is to store water, the primary function of Morrow Point Dam is to produce hydroelectricity. It has about twice the power capacity of Blue Mesa Dam. Crystal Dam is a double curvature thin arch dam located six miles (10 km) downstream from Morrow Point Dam. Crystal Dam is the newest of the three dams in Curecanti; construction on the dam was finished in 1976, forming Crystal Reservoir. Below Crystal Dam is the East Portal of the Gunnison Tunnel, a National Historic Civil Engineering Landmark. Just below East Portal is the eastern boundary of Black Canyon of the Gunnison National Park. Elk Creek Visitor Center is located 16 miles (26 km) west of Gunnison, Colorado on U.S. Highway 50 and has displays on the natural and cultural history of the area. Cimarron Visitor Center (closed) is located in Cimarron, Colorado near Morrow Point Dam. The visitor center has narrow gauge railroad cars and engines on display. Lake Fork Visitor Center (closed) is located near Sapinero, Colorado near the Lake Fork Campground. There are also two marinas and five boat launches along the shores of Blue Mesa Reservoir. Elk Creek Marina is located near the visitor center at Elk Creek. This marina also includes a restaurant and boat launch. Lake Fork Marina is located near Sapinero, Colorado and is nearby both the Lake Fork campground, visitor center, and boat launch. The Neversink trail is located nearest to Gunnison on the north bank of the Gunnison River near a Great Blue Heron rookery. This streamside habitat with its heavy undergrowth of grasses, flowers, cottonwoods, and willows, is ideal for birdwatching or just a quiet stroll. Ascending through sagebrush, ponderosa pine and riparian habitats, this trail offers spectacular views of Blue Mesa Reservoir, the distant San Juan Mountain peaks, and the weirdly eroded volcanic Dillon Pinnacles. Along the trail are a few shady places to rest and open sunny vistas with possible glimpses of bighorn sheep. Horses permitted. Interpretative signs explain geologic history. Benches are provided. Good shoes or boots are recommended. Carry at least 2 quarts of water per person. Length: 4 miles (round trip) Difficulty: moderately strenuous; 600 ft (180 m) ascent. Directions: off Hwy 50, 6 miles (9.7 km) west of Elk Creek Visitor Center. Follow the beautiful Pine Creek as it cascades into the depths of the upper Black Canyon to Morrow Point Reservoir. Then take a walk along the old narrow gauge railroad bed along the reservoir. Learn the history of the area by reading the interpretive signs on the trail. Be sure to check for ticks during the hot summer months. Fishing, camping, and boating access for Morrow Point Reservoir. No boat launching facilities. Small hand-carried craft are permitted if carried down the steps (and back up). Length: 2 miles (round trip) Difficulty: Moderately strenuous. 180 ft (55 m). decent into the canyon via maintained steps. Carry at least one quart of water per person. Directions: Off Highway 50, one mile (1.6 km) west of its junction with Highway 92. A short steep road leads to the trail. Parking space is limited. Drop-off parking for trailers is available at the top of access road. The sheer walls and extreme narrowness of the Black Canyon are appreciated along this trail as well as views from the base of the Morrow Point Dam. A footbridge over Crystal Reservoir provides access to the north shore of the reservoir, to which this trail follows. Fishing and boating access to Crystal Reservoir. No boat launching facilities. Small craft must hand launched. Caution: Releases from Morrow Point Dam can cause strong currents and fluctuating water levels. Walk in picnic area is located on the north shore. Length: 1.5 miles (round trip) Difficulty: Easy to moderately strenuous. Directions: Off Highway 50, at Cimarron. Drive one mile (1.6 km) to Morrow Pont Dam parking area. After descending from the high rim of the Upper Black Canyon of the Gunnison, the trail follows Curecanti Creek as it falls toward Morrow Point Reservoir. The Curecanti Needle, a 700 ft (210 m). 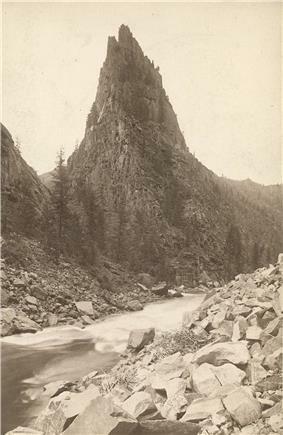 granite spire, towers above at the trail's end. Good shoes or boots are recommended. Carry at least 2 quarts of water per person. Two campsites with picnic tables, fire grates, and toilets are provided at the end of the trail. Length: 4 miles (round trip) Difficulty: Strenuous. Elevation change 900 ft (270 m). Allow 2–3 hours for round trip. Directions: The trail head begins at the Pioneer Point overlook, off Highway 92, 5.7 miles (9.2 km) from its junction with Highway 50. Zigzagging through oak, pine, juniper, and fir, hikers descend to wooded camp and picnic sites on the shores of Morrow Point Reservoir. Campsites with picnic tables, fire grates, and toilets are provided at the end of the trail. Good shoes or boots are recommended. Carry at least 2 quarts of water per person. Check for ticks frequently during the hot summer months. Winding through abundant wildflowers, Gambel oak, aspens, conifers and a recovering burn area, Crystal Creek Trail is ideal for spring or fall hiking. Sweeping views of Cimarron Valley, the West Elk and San Juan Mountains can be viewed along the way. The trail ends at an overlook, 1,800 ft (550 m). above Crystal Reservoir. Good shoes or boots are recommended. Carry at least 2 quarts of water per person. Check for ticks frequently during the hot summer months. Length: 5 miles (round trip) Difficulty: Moderately strenuous. Trail begins at 8,900 ft (2,700 m) above sea level. Allow 2 hours for round trip. Directions: Off Highway 92, 24 miles (39 km) from its junction with Highway 50. The Denver and Rio Grande Western Railroad Narrow Gauge Trestle is located in Cimarron Canyon near Morrow Point Dam. It is the last remaining narrow gauge railroad trestle in the Black Canyon of the Gunnison. The trestle was built in 1895 by the Denver and Rio Grande Western Railroad and was placed on the National Register of Historic Places in 1976. ^ Pronounced (locally) or .